What a wonderful week! 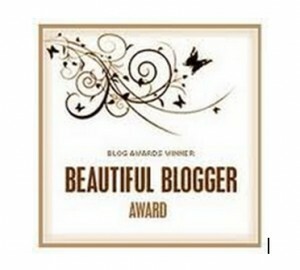 First, I’m nominated for the Versatile Blogger Award, and then when I share my fondest memories, as requested for the award, Jenness Johnston http://jennessjohnston78.wordpress.com/ nominates me for the Beautiful Blogger Award! Jenness, your appreciation of my sharing these real things in my life means so much to me. 1. I have two plants. One looks a little like a palm tree, and I call it “Cher,” because it has a long, slender stem and a lot of long leaves. The other is short and stopped growing. Of course, that’s “Sonny.” When I talk to them every morning, their leaves respond to the sound of my voice. 2. I recently became a vegetarian. I’m working my way to turning vegan. 3. I also recently found some good friends that I can count on. They gave me the nickname “Cuba.” Yes, probably because my parents are from there, but I don’t really look it. I’m a white boy with blue eyes who grew up speaking Spanish, and I can dance salsa. 4. I enjoy running. It gives me a sense of freedom. 5. In the summer in the late afternoon, I open my bathroom window, turn off the light, turn up the mellow music and take the most relaxing shower ever. 6. After everything that has happened in my life, I have learned to appreciate the simple and humble again. I’ll be back in two weeks with a new blog. You all rock!